THE human nose has inspired a team of researchers to create a similar device that smells the presence of toxic chemicals in the atmosphere. The human sensor coordinates signals sent by thousands of sensory neurons to detect smells. 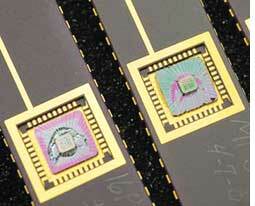 The sensor, in this case, is a silicon chip which consists of nickel oxide nanoparticles acting as the neurons. When a chemical touches the surface of the oxide, it responds electrically; the response varies because each chemical has its own signature. The sensor detects the response and, in turn, helps identify the chemical. Patricia Morris, professor of Chemistry at Ohio State University, with doctoral student Elvin Beach, had to first find a simple and easy way of making nanoparticles of nickel oxide. The nanoparticles would give the sensor a large surface area to quickly capture and identify a wide variety of chemical molecules. The team subjected nickel oxide to a pressure of 225C. In less than 24 hours they obtained nanoparticles which were then washed in a common solvent called methyl ethyl ketone. "You mix everything together in a pressure vessel, pop it in the oven, rinse it off and it's ready to use," said Beach. The team then applied a thin coating of the nickel oxide nanoparticles onto the surface of a silicon chip. The details of the synthesis are in the June issue of Materials Chemistry and Physics. Each nickel oxide nanoparticle measures about 50 atoms across. The researchers claim a one-gramme batch of nanoparticles costs about US $5 (Rs 240) to make; one sensor carries only four nanogrammes of material, so the chips are cheap to make. These sensors can provide a low cost method for air qualitymonitoring. But the researchers are yet to use them in the field.